funny, outgoing, well able to make people laugh, honest reliable. Love greyhound racing and animals in general. I fairly tall and dark. Love working as I work for myself, like to get things done right, I'm also very good on time, hate when people are always late!! honest caring funny and easygoing, able to have the Craic. lets go on a date and see if you are ideal!! Where ever we are comfortable. bruce springsteen, kings of Leon, cold play. 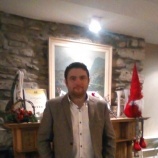 arewebusy is a Male dating in Tipperary, Ireland. Check the description of this 38 years old profile, he is African American/Black and Catholic maybe this matches your profile description and you can both start dating in Ireland for free. The stars says he is a Sagittarius maybe you should check your horoscope and match up your star sign.